A recent local accident involving a large truck and a motorcycle has resulted in injuries to two people, one of whom was in serious condition. 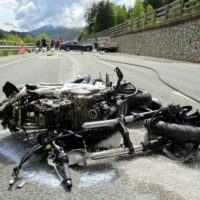 The crash shows the vulnerabilities of motorcycles on the road, as well as the dangers of traveling at excessive speeds. The crash happened in the Orange County town of Maybrook on the evening of Sunday, April 9, 2017 on Neelytown Road. A tractor-trailer pulled out in front of a motorcycle. The bike, unable to avoid a collision, slammed into the side of the tractor-trailer. At the time, the bike was carrying both a driver and passenger. Both occupants of the motorcycle needed medical attention, with one occupant’s injuries putting the individual in serious condition. Witnesses later told law enforcement that the semi-truck was speeding at the time of the collision with the bike. While motorcycles can be extremely agile and hold a reputation for being highly maneuverable, there are occasions where a motorcycle may be unable to avoid a collision that a passenger vehicle would be more capable of dodging. Often, drivers of other vehicles are not accustomed to scanning the road in front of them for smaller objects such as motorcycles, and they may fail to notice that a bike is oncoming when looking at the road ahead. Additionally, it can be more difficult to accurately estimate the speed of an oncoming motorcycle versus that of a car, and many drivers estimate that bikes are traveling more slowly than they actually are. As a result of these phenomena, cars and trucks often cut into motorcycles’ paths when it is too late for the bike to brake or swerve to avoid a crash, since sharp turns can cause a motorcycle to enter a dangerous skid. Since motorcycles lack the protection offered by a large front end, when bikes crash head-on with the side of a vehicle, bikers can suffer serious injuries. Tractor-trailers require a great deal of extra time to bring to a stop, relative to passenger vehicles, and can also do far more damage when they do collide with smaller cars and bikes. It is for this reason that lawmakers and safety regulators have long suggested installing speed limiters on large trucks. If you or someone you love has been involved in a motorcycle crash caused by another driver’s negligent behavior, contact the knowledgeable and seasoned Hudson Valley personal injury lawyers at Rusk, Wadlin, Heppner & Martuscello, LLP for a consultation, at 845-331-4100 (Kingston), or 845-236-4411 (Marlboro).